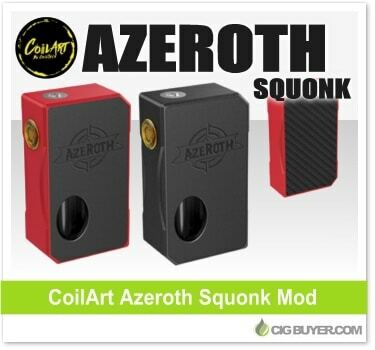 CoilArt Azeroth Squonk Mod – ONLY $35.99! Add the CoilArt Azeroth Squonk Mod to the growing list of mechanical squonk mods. Powered by either a single 18650, 20700 or 21700 battery, the Azeroth Squonk Mod is compact and flexible and includes a built-in 7ml silicone squonk bottle. Available in all black or several two-tone color combinations, it features an anodized aluminum body with a magnetized cover plate, carbon fiber back plate, ultem firing button and self-adjusting battery contact. Just add your favorite squonk compatible atomizer and you’re good to go!